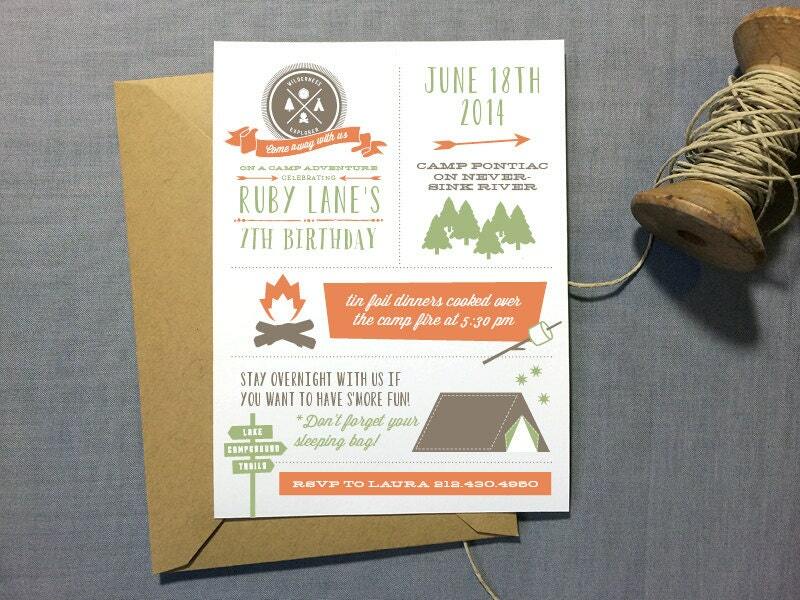 A cute, personalized child's birthday invitation featuring a wilderness badge, trees, tent, camp fire and s'mores. Perfect for a camping birthday party! Customize it with your choice of colors and wording! It can be adapted for any other event! I will work to provide you with exactly what you hoped for. By purchasing this listing you will receive a printable digital file that you can print anywhere – OR— choose our printing & finishing services to have your complete invitation package finished by us, including matching envelopes of your color choice! PRINTABLE ORDER: $25.00 for PDF or Jpeg sent via email. No physical invitations will be mailed to you unless you have selected a printed order, this product will be sent to the email address listed on your Etsy account. PRINTED ORDER: Choose the quantity you'd like from the drop-down menu. Associated costs are listed for printing services. Shipping fees are included in the price for US customers. If you're outside the US, just convo me before ordering to get shipping rates for your country. **If you prefer to wait to order printing services until you've seen a proof, it can always be added later on. The $25.00 will act as a deposit to go towards your order and I'll invoice you for the rest. I will take your information and create a digital, customized PDF proof for your review with your color preferences and personalized wording. Once you have approved the proof, I will email you a print-ready file (either jpg or pdf) that you can print at home or take to a print center or copy shop to have printed. If you've chosen our printing services, printing will begin when proofs are approved. ***For PRINTED ORDERS, you'll receive a high-quality printed product on 110lb matte card stock. Each invitation includes a matching envelope. In addition to the information above, please indicate your envelope color choice. Turnaround for printed orders is 2 weeks.